2X ApplicationServer now incorporates a Publishing Wizard which will guide you through each step needed to setup Published Applications and Published Desktops in the shortest amount of time. 2X ApplicationServer allows you to publish particular applications installed on a Terminal Server onto the desktop of a remote user. For example you can tunnel just an accounts package onto a user’s local desktop without giving the user access to a full desktop or publish a full desktop as an application on the Terminal Server. Deepnet Unified Authentication is a single integrated platform for provisioning, managing and verifying all types of authentication, form-factors and user credentials. 2X ApplicationServer provides this two-factor authentication using SafeID, FlashID, MobileID, QuickID, GridID, SecureID (RSA), DigiPass (Vasco). Using the 2X Client you can now connected to a machine running Microsoft Terminal Server using a Remote Desktop Protocol connection. 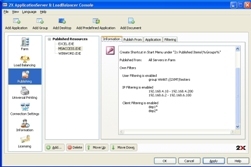 Administrators can easily configure desktop connections and publish applications using one tool. 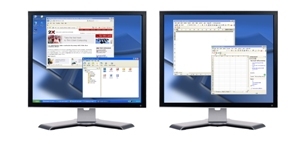 With your 2X Client you can now use Embedded Desktops. This allows you to load a number of different Desktops inside one application. Switching between the different desktops is as simple as clicking on a different tab. To the user the remote application appears exactly like a local application. Remotely hosted applications will automatically show up in the local task bar and/or on the desktop. If your users minimize a remote application, the application minimizes to the local taskbar. You can also copy and paste between local and remote applications too. 2X ApplicationServer now incorporates a Universal Printer driver, eliminating the need to manage and install printer drivers on your Terminal Server. The user can print either to their default locally attached printer or have the document displayed in a PDF reader such as Acrobat Reader. 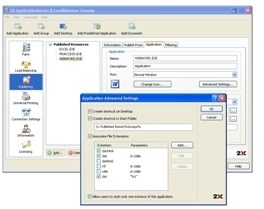 Allows the Administrator to register specific file extensions to a published application, this enables the user to open a file from his local drive (requires Windows 2003 to support drive redirection) and to run and display it in the published application.